Here's something I bet you didn't know. Or maybe you did, but either way it's still pretty cool. 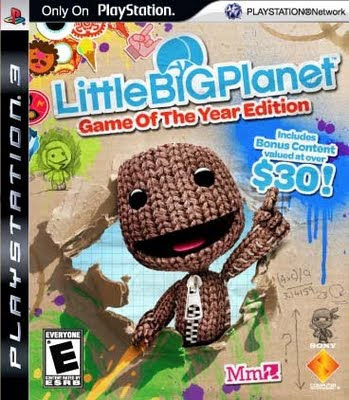 I received a heads up from Playstation Canada last month that the LittleBigPlanet Game of the Year edition features 18 never-before-seen levels developed by select LittleBigPlanet fans, three of which were designed by Canadians. "Each creator was hand picked by developer Media Molecule based on previous levels that these enthusiasts have created and shared online. Once identified, all 18 consumers were commissioned and monetarily compensated to design a completely new environment for the LittleBigPlanet world, allowing each fan to truly become an amateur video game developer." LittleBigPlanet GOTY edition also includes free downloadable content packs with themed levels and costumes, and exclusive access to the upcoming ModNation Racers online beta. Since the games launch last fall, over 1,000,000 user generated levels have been published to the Playstation Network since LittleBigPlanet hit shelves. Or as Sony likes to put it, one new level has been created roughly every 21 seconds since launch. I tell you, these Canadians are taking over the world. We have amazingly talented AAA developers, indie developers and yes -- even LittleBigPlanet developers. It makes sense when you think about it, I mean we have so much time to just sit around and be cool here in Canada. Like the props for the Canadians, but should we be fueling the stereotype that we all live in igloos lol? I've heard that stereotype so many times now I think I'm immune to it. I live in Southern Ontario and I remember hearing in my grade 8 geography class that 1/3 of the US is more northern. So yeah, needless to say, it's not that cold here.